Do not exceed the word limits on college essays. The Common Application has a personal statement word limit for a reason. 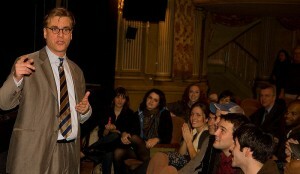 Even Aaron Sorkin, creator of “The West Wing” has to stick to hard outs (photo credit: Eric Weiss). “The Daily Pennsylvanian,” the newspaper of the University of Pennsylvania, ran an article today in which we’re quoted that discusses the frustration students have with the Common Application word limit. In recent years, on the Common App’s personal statement, for instance, there hasn’t been a word limit. But last spring, the Common Application implemented a change by declaring a 250-500-word limit on the personal statement. Many students, parents, and guidance counselors were upset by this. We weren’t. Word limits are a good thing. When you don’t have a word limit in place, students tend to be all over the place. They think more is better when in fact, the truth of it is, less is often better. As the University of Pennsylvania Dean of Admissions Eric Furda stated to “The Daily Pennsylvanian,” “There are a number of risks if the essay is too long. We might not read the whole essay…That doesn’t mean that you’re not admitted, but you’re running a risk that’s probably not necessary.” While the Common Application doesn’t have the mechanism to reject personal statements that are submitted that exceed the word limit, we strongly urge applicants to abide by the Common Application word limit. It’s there, after all, for a reason. No matter how gripping your college essay is, it can be said in 500 words. Would you say Aaron Sorkin, the creator of “The West Wing” and the writer of “The Social Network” is a pretty good writer? Each episode of “The West Wing” had a hard out. Same with David Chase in “The Sopranos.” They, too, abide by word limits (although, admittedly, Sorkin’s “Studio 60” did often run about a minute long which put NBC brass in a predicament). But you’re not Aaron Sorkin. You’re a high school senior.